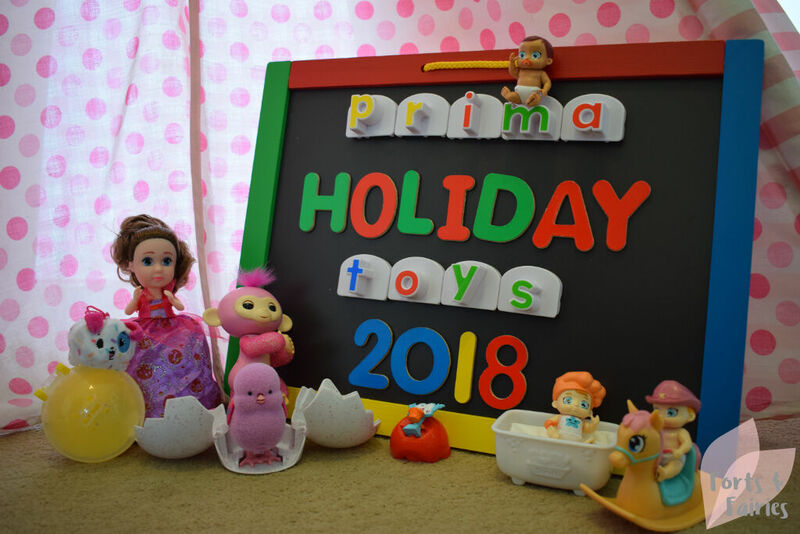 The Easter holidays are coming up, and thanks to Prima Toys it’s easy to spoil your little ones with a few new, egg-citing toys. Whether you want to add something a little special to the egg hunt or pack an extra surprise for a trip away, these are the latest toys to hit the shelves that your children are guaranteed to think simply egg-ceptional. And they all pack an awesome surprise element too! Your children will squeal with delight when this little Surprise Chick hatches from his egg. You’ll hear soft cheeps, tapping and then a gentle cracking sound before he hops out. The best part is that you can put him back in, and the chick will hatch all over again! Your kids will love watching him hop around, cheeping as he goes…the perfect companion for Easter. There are five Surprise Chicks to collect, and you will only know which one you have once it hatches at home. You can win an amazing Little Live Pets: Surprise Chick House, be sure to enter the competition today! 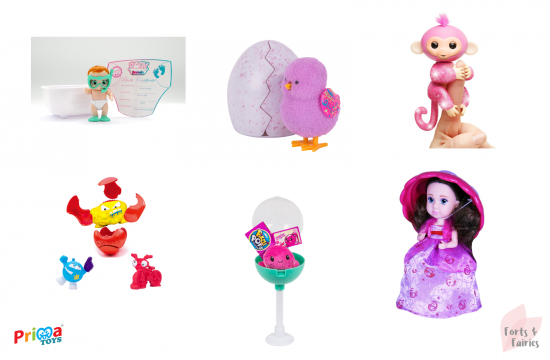 I collected Diaper Babies when I was younger, and now this collectibles craze is back with the new Baby Secrets! These cute babies feature a colour changing nappy, dip them in water to reveal their gender. There are four themed packs to collect, each with three babies, one bath tub, an accessory, and even birth certificates. You can also add to your collection with the single packs available, and with over 50 to collect there is lots of fun to be had with collecting, swapping and showing off your Baby Secrets. 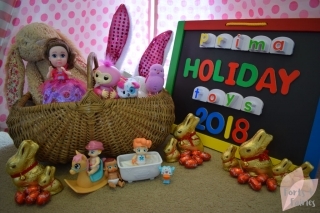 The Fingerlings pets are now available in beautiful glittery colours. This interactive baby toy monkey will steal your heart with his cute monkey babble as he holds onto your finger, all the while blinking his eyes, turning his head and even blowing kisses. They love swinging by their tales, being rocked to sleep, and with over 40 sounds it won’t be long before they’re your child’s new favourite pet. The Fingerlings are available in a range of colours. The Cupcake Surprise dolls transform from a colourful cupcake into a collectible doll, each with their own outfit and scent. The cupcake base unfolds into the doll’s glittery skirt upon which the princess can now stand. The doll is soft with lovely hair that you can style with the included brush and she has two poseable arms as well. We got a lovely strawberry scented doll whose little cupcake topper even fitted sweetly on her head as a hat. There are 12 to collect. Unwrap the big Pikmi Pops lollipop to find a hidden Pikmi plushie inside, sweetly scented and ready to cuddle or be used to brighten up a backpack or pencil case. 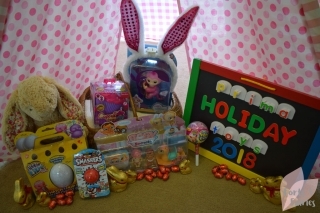 There are over 45 to collect, with different scents including chocolate and bubblegum, and each one has a special message for your child. We were lucky enough to unwrap the rare Smorey the dog plushie. She has an amazing vanilla bean marshmallow smell, and because she now goes everywhere with us my car smells delicious! There is an exciting character inside each smashball. Smash it open to find out which character from the world’s most popular sports you got, and get ready to battle, collect and score because each Smashers has its own smash point value. 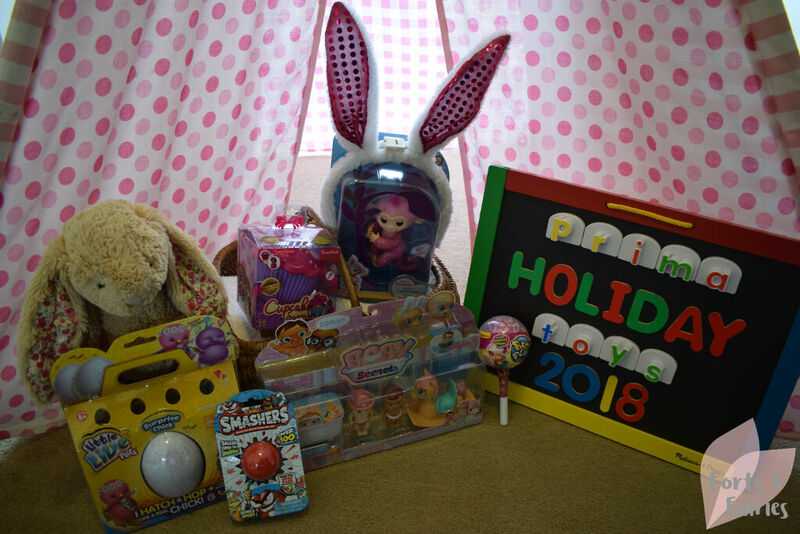 Smashers combine two things kids love, collecting and unboxing, and your children will enjoy smashing it open to discover which character is hidden inside! Thanks to Prima Toys for letting us in on the surprises Easter has in store for everyone! Smashers are my son’s favorite. Pretty cool concept to smash it open, definitely lots of fun for boys!